What a storm we hit!!! 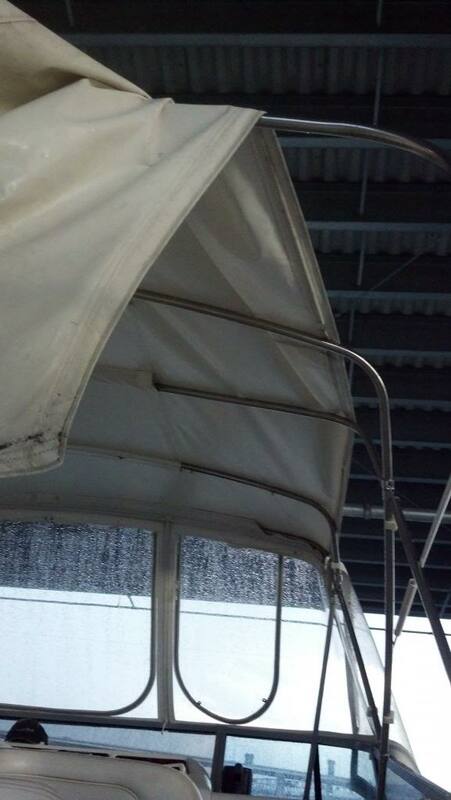 We got caught in a doozy of a storm yesterday afternoon and suffered some canvas damage and lost the radar. We started out about 3:30 for a dinner cruise with GW's 97 year old mother on board. After a nice leisurely cruise up the Columbia we anchored in a fairly well protected cove. There were some other boats in there but it wasn't crowded. After about an hour we started to fix dinner. We'd been watching a lightening storm that was passing to the south of us and had grown in intensity. There were almost constant lightening strikes coming down and it was exciting to watch. There was a lot of rain failing form the clouds but it was all to the south and west of us. The wind was blowing from the SW so the storm was moving away...or so we thought. We were doing fine and enjoying watching the storm and watching to see if any part of it was headed our way. It wasn't, so I felt fine. Then, all of a sudden there was a lightening strike just to the north of us followed immediately by a loud thunder clap, which indicated that part of the storm was very close. At the same time the wind shifted from the SW to blowing hard out of the north. The boat swung on the anchor but we were OK because it put us more toward the center of the small bay. Then the wind shifted back to the SW and picked up more (now blowing ~25-30 mph) and we started to drag anchor in the muck bottom. We weren't that far off the shore so I told GW I was going to reposition the boat and drop anchor more in the center of the bay. I had no sooner fired up the engines and lifted the anchor when the wind REALLY started to blow. This little bay is about 150 yard across and there were white caps forming already. The rain had picked up and was coming down HARD, and blowing sideways. Over the intercom I told GW we were heading for home and to get things ready down below for getting up on plane. She got everything safely stowed and told me when she was ready. I turned on the radar as soon as I had decided to get underway because visibility had dropped to less than a hundred yards. I turned to the east to head out of the bay and down the Columbia when we were hit by a huge gust on the stbd side of the boat. 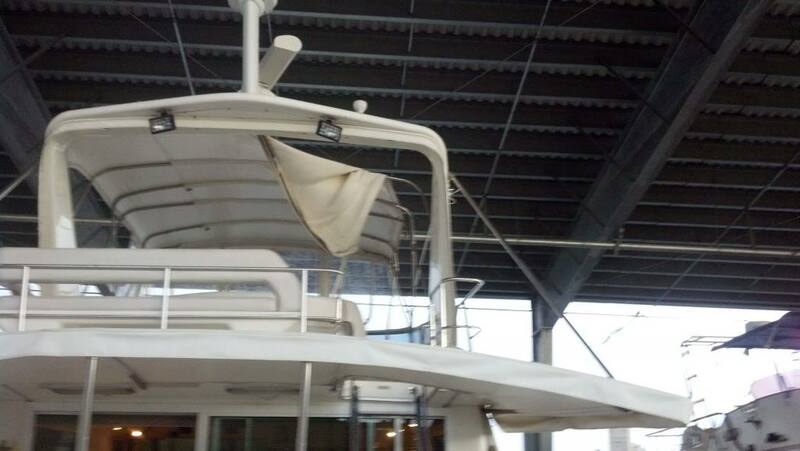 It ripped the top bimini loose from the plastic channel that holds it in place and tore out one of the side windows. 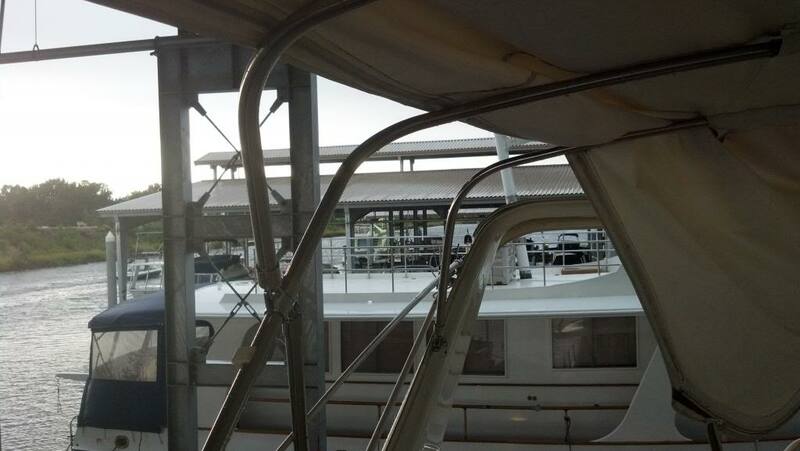 When that gust hit the boat it tilted the boat about 10-15 degrees to port and held it there a few seconds before it passed by and the boat righted itself. I pretty much ignored the no-wake speed so I could get out of that shallow cove, traveling about 10 kts as I left the area. As I was leaving the no-wake zone the radar timed in so I flipped it to transmit mode and it quickly picked up a boat about 1/2 mile away that was headed our direction. I couldn't see the boat but did steer to avoid it. As I got out of the no-wake zone the rain was really coming down hard, the thunder and lightening were very close, and it was really blowing. GW brought me up a foul weather jacket because I didn't have a shirt on and the rain stung when it hit. I got on plane and headed back to the marina. As we were cruising along I had one eye on the radar and one eye trying to peer through the heavy rain. About half way back to our marina there was a lightening strike on shore just off our stbd side. When it hit I was watching the radar screen, which lit up very brightly then went black. I'm glad we were able to get back relatively unscathed, but I bet my insurance guy isn't going to like my phone call this morning. Whoa! Glad you got out of it with no damage other than what you described. Which is still too much, of course. Scary story!! And well told, too, so thanks for the vicarious excitement. Wow, goes to show you how quickly things can change out there! Certainly a lesson, or at least a reminder, for us all. Thanks for sharing. One thing I do now is flip on the radar as soon as I see foul weather. Your first pic is a classic example, but cumulus clouds, particularly tall ones, are another good indicator. You should be able to see rain pretty far out even with a lower-power radar. The open array shown in the other pics suggest a more powerful set that should be even better. Practice at the dock, you'll be amazed at how well you can predict which way the rain is coming, and especially at how far away you can see it. Isolated rain squalls bring the possibility of strong winds, although no guarantee the two always come together. I like a little excitement now and then. That's a little too much excitement. Is there anything you would have done differently? I'd like to learn from your experience. If in internet range with a hotspot...I pull up wundermap on weatherunderground to see where the bad stuff in relation to my position...also check the wind input that tells me a lot too...dodged some bad stuff last year whle underway in NC and SC (tornado warnings) by slowing down or speeding up and ducking up a river off the ICW if necessary to miss the bad cells. Ran into this storm a couple of months ago. Had zero visibility so I hung just outside the channel for about 45 minutes until it blew by. We ended up about 1/2 mile down the channel because it was blowing so hard. Except if you are in a bad cell...often your radar picture is masked by heavy rain and can't see the possible tornado "hooked radar image" or just a worse cell coming your way/heading you off. Even Weather Radar sites get masked by heavy activity. That's desert weather. We basically never get stuff like that in western Washington. What kind of anchor do you have? Interesting and frightening story. Glad you are OK. I would suggest, that should you have a situation like that in the future, that running on plane in poor visibility is a really bad idea. Even at 10 kts, and I doubt your boat will plane at that speed, you are in no position to stop in time for something in your way. What if some poor soul got caught out there in a rowboat fishing, or a kayak. Although frightening it might have been better to let out more anchor rode, or at the very least, proceeded slowly at a speed commensurate with visibility. Hope you take this in the spirit in which I offer my comments. Again, glad you are OK.
Q: Which state has the most thunderstorms? I also found that downdrafts can produce gusts in severe thunderstorms up to 160 MPH. Whoa! That would tear an anchor loose in a minute, or even several anchors. All true. But the discussion was "what would you do differently next time." I was focusing in on the lack of an Internet connection to predict that the storm was coming. JW, Down here at the South end of the state thunderstorms like those develope almost every afternoon. Luckily they usually stay inland over the Everglades. 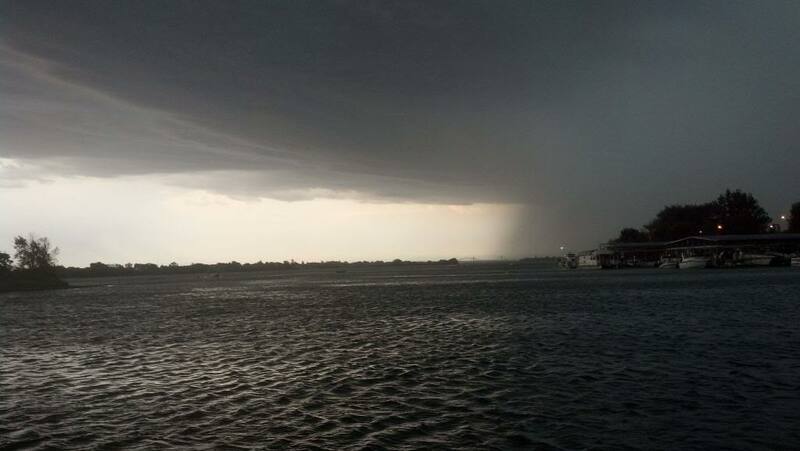 I once saw three water spouts side by side walking north in Biscayne Bay. They were full of sharks! No wait, the sharks were in a movie, the water spouts were real. It doesn't matter whether you are good or not at using a boat Radar...they can't see what's on the other side of bad cells like the internet or any composite Radar picture can give. Your woods are not out of the woods. We don't get powerful tornados like they do out west. When on land some trees get knocked over and screens around pools get torn up. I've never heard of anyone being killed by a tornado in South Florida. John, you only need to talk Yankee over on Miami Beach. On the mainland you can talk redneck or Cuban redneck.